unos pican y outros non. No offense, but I can certainly say I am lucky. I realize it all of a sudden a Sunday morning in the middle of summer, while I walk around the stalls of a neighborhood farmers' market, still sleepy, and, between endless varieties of tomatoes - pink (!!!!!! ), black, and cherry red - among Korean melons, Thai basil, tomatillos and lemongrass, between Chinese spinach and sweet potatoes, in the hands of a Mexican teenage boy to my own surprise I find these peppers, which I happened to taste for the first time spread on top of a deliciously sweet pizza, and then again cheesely lying on a bed of almond cream during one of those romantic evenings that smell of strawberries, basil, and illusions. 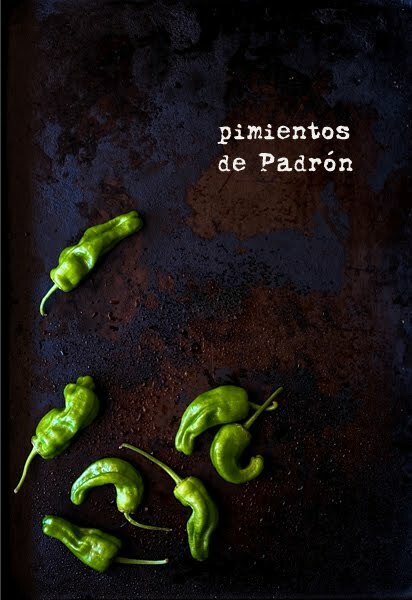 These pimientos de Padrón are a variety of small green chilies, typical of the region of Galicia. They are commonly served as a tapa in the local taverns, usually accompanied by a nice and refreshing cold beer. The characteristic that makes them appealing as well as famous, is the fact that some of them are harmless and sweet, others are intense and spicy, but it's impossible to know, since from the outside the two varieties look exactly the same. For this reason, someone said that our peppers are like a Russian roulette, sweet or pungent, you never know what will happen. Any bite could be fatal, and hit you like a super hot puncture. Me, I'd rather think that they are just like the Alpine sky on an August afternoon, mysterious and unpredictable, a minute before it's warm and blue, and then suddenly it becomes arrogant, brash, and stormy. Or, if you excuse me, I'd rather say that these small pimientos are just like the night, like all those sleepless nights that are sometimes sweet, sometimes bold and violent. Not sure what to prefer, but in the end you don't even have to choose. Why try to prefer one over the other when you can have both? Just let yourself go with trust, surrender to their temptress and illusory tenderness, and let each bite surprise you with such elusive goodness. Shamelessly and blatantly a non-recipe. But trust me, the best way to enjoy these adorable pimientos - lucky me - is also the simplest in the world. Heat some extra-virgin olive oil in a heavy skillet, wash the peppers, pat them dry, and add them to the pan, whole. Let them cook thoroughly over medium-high heat until they soften and darken on both sides. 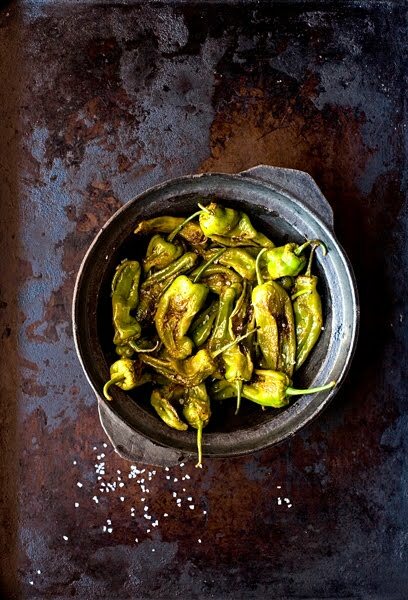 Pull out from the back of your pantry your most precious salt, and use a generous handful to flavor the pimientos. If you like - I do, for sure - add also some fresh lemon juice. Accessorize with a glass of beer and possibly with a nice and sunny afternoon. فعملية بخ المبيدات تفتقر الى متخصصون ونحن نتميز بفريقنا المختص والمتألق فى ميدان البخ وخدمتكم باستمرار، فرش المبيدات ليس امرآ سهلا ولا صعبآ حيث أن فريقنا الفريد من المتخصصون والمهندسين ذو الخبرة العالية والتعامل مع المبيدات ومكافحة مختلَف أشكال الحشرات المضرة والزاحفة والطائرة والسامة ففريقنا يتمتع برؤية فنية من جميع الأركان التى تتيح لهم التداول على نحو صحيح بلا اى خطورة على أطفالكم فرش المبيدات يتطلب الى مجموعة عمل فريد ذو خبرة حتى لا تكون هناك اى عواقب وخيمة تتم عقب هذا لاقدر الله ولكن مع مؤسسة بخ مبيدات بالاحساء فأنتم تسعدون بتعاملكم معنا كما نسعد بتواصلكم معنا ونسعد كذلك لاى أستفسار أو إقتراح فيما يتعلق مؤسسة بخ مبيدات بالاحساء .